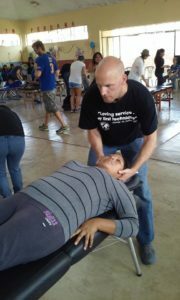 Dr. Murray adjusting a patient during a mission trip in Lima, Peru. If you are like most people, you are probably a little bit confused about Chiropractic. What does a Chiropractor do? How does it all work? These are great questions that patients often wonder and I will do my best to answer them in this post! What does a Chiropractor do? Simply put, the job of the Chiropractor is to analyze the spine for misalignments, which are called subluxations. These subluxations cause an interference in signaling between the brain and the body. Once a subluxation is found it is removed with a specific adjustment. The adjustment creates motion in the spine which allows the nervous system to conduct signaling at a higher level. The old adage, “Motion is life” is a great way to describe how Chiropractic makes people feel better, and more importantly function at a higher level. How does it all work? This question is a bit more complicated due to the fact that there are many facets to how the adjustment effects physiology. The two main categories are structural and neurological. Structurally we see changes in how a persons spine moves after an adjustment. For example, a patient may come into the clinic with a head tilt or a curve in their spine that should not be there. These postural abnormalities effect physiology in many ways. Some people get headaches, have digestive issues, and of course experience neck or back pain. Once the head tilt or curve is corrected back to normal (usually after a series of specific adjustments) they start to feel changes. Headaches are less severe and less frequent or gone altogether. Digestive issues are decreased or go away***, and aches and pains start to disappear, even after years of being there! Neurologically we see amazing changes as well. When someone’s spine is stuck in an abnormal position the proprioceptors are not functioning properly. Proprioception is how the body knows where it is in space. For example, if you close your eyes and touch your nose, your proprioception is what allows you to find it without looking. Sensors all over your body help the brain know where you are and how to move all of your muscles. Why is this important for Chiropractic? Information from proprioceptors travels along the nerves, which in turn travel up and down the spine. Even more importantly, proprioceptive information travels FASTER than pain receptors. When your proprioception is decreased, you are more likely to experience pain. Instead of being flooded with information about where and what all of your muscles are doing, your pain receptors are flooding the brain with signals. Once the adjustment is made and the spine starts moving properly, the nervous system is again flooding the brain with proprioceptive information and pain receptors are “turned down”. I hope this helps you understand a little bit more about Chiropractic, and as always feel free to reach out if you have any questions! ***Disclaimer! Chiropractors do not treat specific diseases! We simply address subluxations in the spine which can allow the body to heal itself of different named conditions.